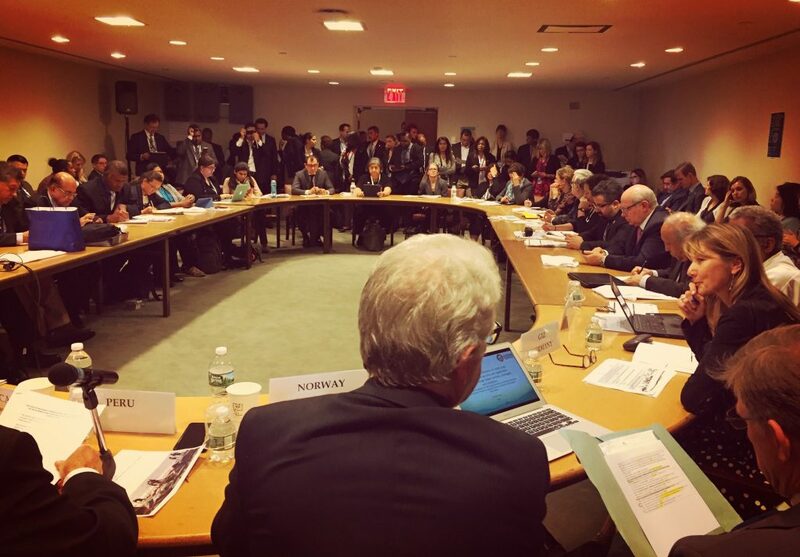 During the Ocean Conference in New York on SDG14 TBTI partnered with the representatives of Costa Rica, Norway, Peru, GIZ Germany, FAO, World Fish, Brazilian Artisanal Fisheries Network (TeiaPesca), CoopeSoliDar R.L Costa Rica, ICCA Consortium, IPC Fisheries Working Group and the Swedish Society for Nature Conservation in a side event on 'Joining forces for sustainable small-scale fisheries through a human rights-based approach to ocean conservation'. Interest in the topic was such that a part of the audience had to stand to attend..
After opening remarks from FAO's Assistant Director of the Fisheries and Aquaculture Department, Arni Mathiesen, the Vice-Minister of Fisheries of Peru stressed the importance of small-scale fisheries and reminded participants of the proposal for an International Year of Artisanal Fisheries and Aquaculture, tabled for approval to the FAO Conference in July 2017.. The Voluntary Guidelines for Securing Sustainable-Small-Scale Fisheries in the Context of Food Security and Poverty Eradication (SSF Guidelines) were introduced as an important tool to improve the sector's governance and development, using a human-rights based approach. The interconnection between the SDGs, in particular SDG 14.b, SDG 1 and 2, in the context of small-scale fisheries, was then illustrated in examples of community empowerment from Costa Rica and Brazil. Naseegh Jaffer spoke on behalf of the IPC Fisheries working group and explained the need for an SSF Global Strategic Framework to be developed with the full and effective participation of all regions and in consultation with all small-scale fisheries stakeholders, as agreed by the FAO Committee on Fisheries in 2016.. The work of the TBTI and the role of research in securing sustainable small-scale fisheries was then explained by Ratana Chuenpagdee, who also illustrated related activities of WorldFish. Mechthild Kronen, GIZ Germany, provided an overview of Germany's engagement in small-scale fisheries, including the 10-Point-Action Plan on Marine Conservation & Sustainable Fisheries of the German Federal Ministry for Economic Cooperation and Development which includes encouraging sustainable artisanal fisheries.. The Minister of Agriculture of Costa Rica called on all participate to break the mistrust between the environmental considerations and production in fisheries, to allow securing sustainable small-scale fisheries.. 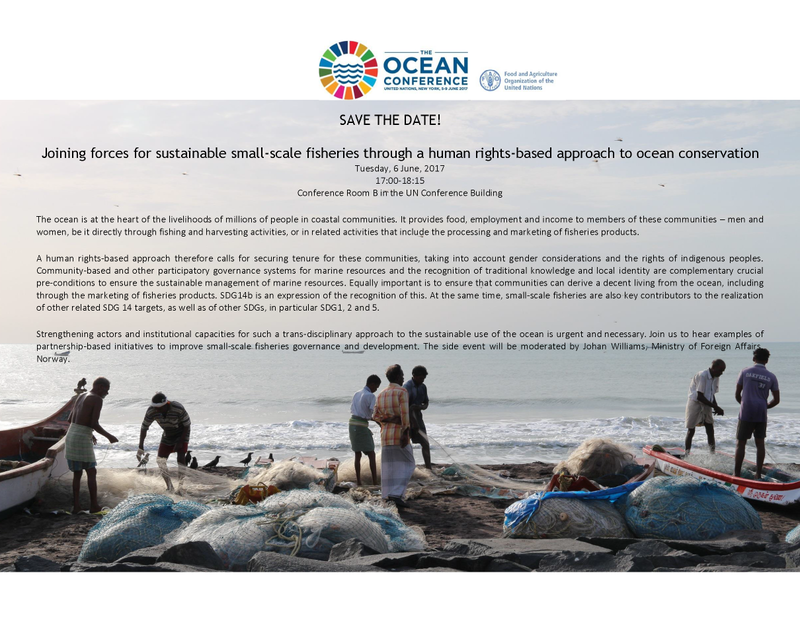 The event emphasized the need to strengthen actors and institutional capacities and build partnerships for a trans-disciplinary approach to the sustainable use of the ocean..